https://sep.yimg.com/ay/yhst-33477391359232/malcolor-niger-grunts-sweetlips-macolor-niger-macolor-snapper-sweet-lips-5.jpgMalcolor Niger - Grunts Sweetlips - Macolor niger - Macolor Snapper Sweet lips DifficultPeaceful200 Gallon26 inchesNoCarnivore, Pellet, MeatyIndo-PacificLutjanidaeSmall 1.5" - 2"
The Malcolor Niger is a high maintenance fish. It needs good experience as aquarist to keep this beautiful fish. Malcolor Niger grows quite big in size if adjusts itself in the aquarium. The Malcolor Niger prefers a tank of at least 200 gallons with plenty of places to hide & swim. Malcolor Niger is reef compatible. Malcolor Niger is fairly hearty and a fairly good eater, once settled in the aquarium. The trick is to get it to eat enough food to survive until it acclimates to its environment. As an initial offering, live foods, such as very small feeder guppies might work best. Malcolor Niger can also be fed on meaty foods such as: frozen silver slides, squid, mussels, and krill. Malcolor Niger may act semi aggressively toward other fish that are small. It may eat very small tank mates that fit in its mouth. Malcolor Niger is compatible with same or like species and may even school in larger aquariums. 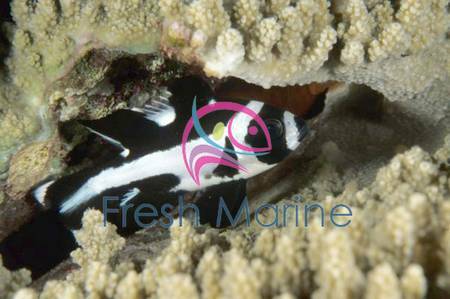 Malcolor Niger fish is reef compatible and is a fairly good shipper. Minimum Tank Size: The Malcolor Niger prefers a tank of at least 200 gallons with plenty of places to hide & swim. Water Conditions: Keep water quality high (SG 1.020 - 1.025, pH 8.1 - 8.4, Temp. 72 - 78� F). Diet: The Malcolor Niger is a carnivore and likes to eat variety of meats, black worms or live mysis, shrimps.